This is the continuation of my earlier post. I strongly encourage the readers to stop here and read the part one of this series if they haven't read it yet. In part one we looked at the brief introduction on MEF and a practical scenario where this framework can be implemented. We talked about HRMS , I have code named it as MangoPeople :). This is not an HR solution but just peeps into it how MEF can help you to build these type of enterprise apps. So let us get jump started into it. Our MangoPeople HR solution is built on WPF using Visual Studio 2010 RC in .Net Framework 4.The Visual Studio solution consists of 5 projects as shown in figure below. MangoPeopleHR : This is based on WPF Application Template. It is an empty shell and just have one Xaml Window. Look at the screen shot below which will give you the fair idea. CommonStuff: This is project based on the standard windows class library project. It contains the helper class of handling commands for ViewModel and the other class has the MEF contract interface. The items 3,4 and 5 are based on WPF User Control Library Project Template whose output is the dll. I hope you must have now got the overall idea of the solution. Now the catch here is that all these modules should be pluggable. If you add them they become active and vice-versa. So to make them active you must copy the module dll into one of the designated folder, I call it MangoPeopleLic. In this folder if the module dll is present that module link will be active if removed it will be inactive. So time has come now to see the inside stuff. The above code besides inheriting the UserControl class also implement the IContract interface. It is also decorated with the Export and ExportMetaData attributes.All MangoPeopleHR modules user control classes have the same code except for the ExportMetaData attributes values and IContract interface property value. So we are done from the modules perspective and now let us jump to the MainWindowViewModel class which gets binded to the MainWindow. One of the most important property in this class is ModulesPurchased. This property is decorated with ImportMany attribute to load all the required composable parts also it is of Lazy type , which means the parts will be loaded on demand. Remember I talked about the glue earlier which binds the main exe with all the dll. This property is the glue here. In modules project the usercontrol classes if you remember we were using Export attribute of same contract and here we are using ImportMany attribute of the same contract. Does that make sense to you , Great !. Now let us look at the other methods which put MEF on fire. The above code listing does the job of adding all the parts in the repository. We use AssemblyCatalog and DictionaryCatalog. The LicenceDirectory is the class variable which stores the path of the folder where all modules dll will be there. So now we have parts in the repository so now let us compose them , the code of which is described below. After getting the value of the CompositionContainer from the GetLicenseInfo method. It tries to call the ComposeParts method.Returns a boolean value dependent on this method call. And now finally let us see the Command method which enables or disables the hyperlink based on the dlls available in the License directory. Here we rotate in the loop and compare the param value with the metadata in the array of ModulesPurchased property. If the match is found the function returns true which will enable the link else the link will be disabled. 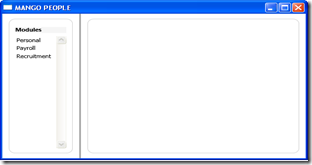 The param parameter of object type is binded in the Xaml via CommandParameter property. So you just saw how MEF simplifies the application partitioning.Though in past we had such frameworks which provided this type of functionalities like Composite Application Blocks,PRISM and Unity to name few. But MEF is different and with ease it can be integrated. It is now the official part of the CLR, what more do you accept to understand its importance.So get started now and start using MEF. You can download the sample code of this post from here. Please ensure to change the value of LicenseDirectory variable to suit to your enviornment otherwise you will get error. Do let me know your thoughts on MEF.